Established in 1870 as a bakery by an ex-convict, The Old Bakery Inn is now beautifully restored with all the charm and character of historical hotels. Elegant rooms have all the modern comforts together with the romance and history of a heritage-listed property. 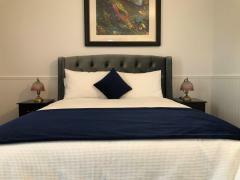 The Old Bakery Inn is only a few minutes walk to the centre of Launceston city and also the spectacular Cataract Gorge.